Bali Ngurah Rai, otherwise known as Denpasar (DPS) is a large international airport with daily flights from over 30 international destinations, including Bangkok, Hong Kong, Manila, Singapore, Dubai, Amsterdam, Seoul, Kuala Lumpur and many cities in Australia. You can also take a flight from Bali to connect with international flights through Jakarta Soekarno-Hatto airport (CGK) which is the 8th busiest airport in the world and has international departures to even more cities including London, Paris, Doha and Tokyo. On arrival we will arrange for you to be collected from the airport or a hotel. Due to the transfer timetable to Nusa Lembongan any passengers arriving at the airport after 15:00 wishing to travel to Nusa Lembongan will need to book into a hotel in Bali. Just let us know which hotel and we will arrange to collect you and get you on the first boat of the day. Alternatively we can organise a hotel for you. On departure we will arrange for your return in a similar way. If you need to be at the airport before 10.30 you will need to leave Nusa Lembongan the day before and book you into a hotel in Bali, which we can organise for you. Please contact us to arrange any specific requirements and transfers. Denpasar also services domestic flights from all over Indonesia, including direct flights from Manado, Lombok and Jakarta. 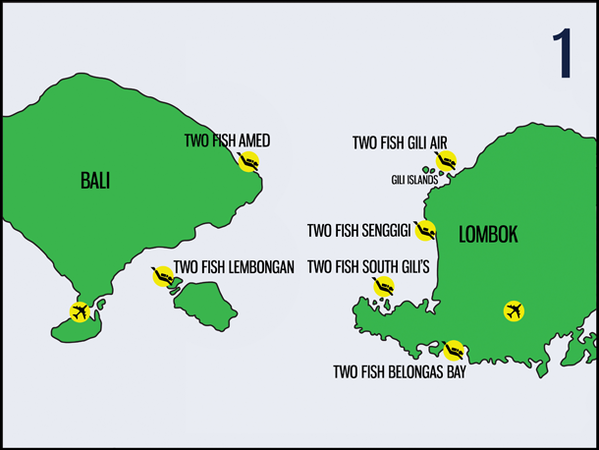 You can also fly to or from almost anywhere in Indonesia using connecting flights. The main internal carriers are Lion Air and Garuda, the national airline of Indonesia. If you want to buy domestic flights then we can help! For booking flights online you will need a local credit card, we can buy for you and email the e-tickets to you. Find out more about buying tickets with us. Flight time is approximately three hours and a one way ticket should cost approximately IDR1,500,000. we can arrange all the transfers and flights for you. 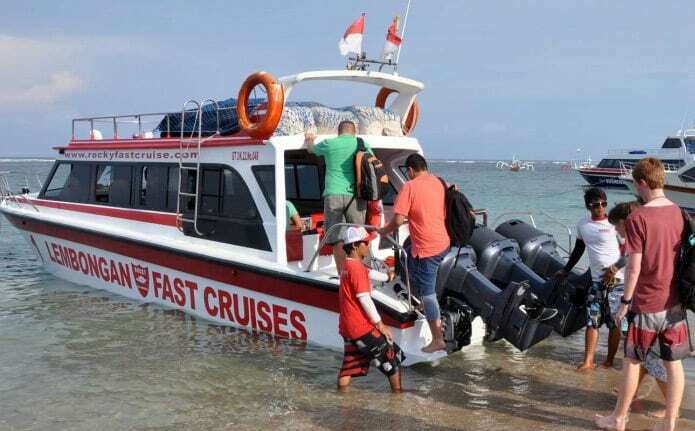 There are many regular scheduled boats that make the 25-30 minutes journey between Bali and Nusa Lembongan using fast-boats. We use Rocky Fast Cruises who provide the service between Sanur to Lembongan. You may need to wade through shallow water when getting on / off the boat for Lembongan (up to knee height) – avoid wearing long trousers! Pick up from a hotel in Sanur, Kuta, Legian, Seminyak, Jimbaran or Nusa Dua is included in the cost of the transport. If you need a pick up from other area, additional charge will be applied (per car maximum 4 pax). we can arrange all the boat transfers for you. Amed is about 2.5 hours by car from Bali Denpasar airport. Two Fish can arrange these transfers for you. The drive itself is very scenic, varying from coastline to winding through tropical hills and rice paddies. We can also arrange transfers to and from other locations in Bali – we are happy to give you a price on request. The other way to get to Amed is by a fast boat (Sea Express) from the Gili’s & Bangsal port near Sengiggi, Lombok – ideal if you want to combine a visit to Bali with diving at our centres in Lombok. The boat ride itself is only about 40 minutes. You may need to wade through shallow water when getting on / off the boat (up to knee height) – avoid wearing long trousers and be careful with handbags / laptop bags! Prices are correct Mar 2016, please check Sea Express website for any amendments to prices or schedule. A one way ticket costs 350,000Rp per person. Is there anything we need to know about arriving in Nusa Lembongan? Is there anything we need to know about arriving in Amed?